Being one of the tree parts of Wulingyuan Scenic Area, Zhangjiajie National Forest Park is the first national park of China which was approved by the State Council in 1982. Located in the northwest of Wulingyuan District, Zhangjiajie National Forest Park is in the neighborhood of Suoxiyu Scenic Spot and Tianzi Mountain. 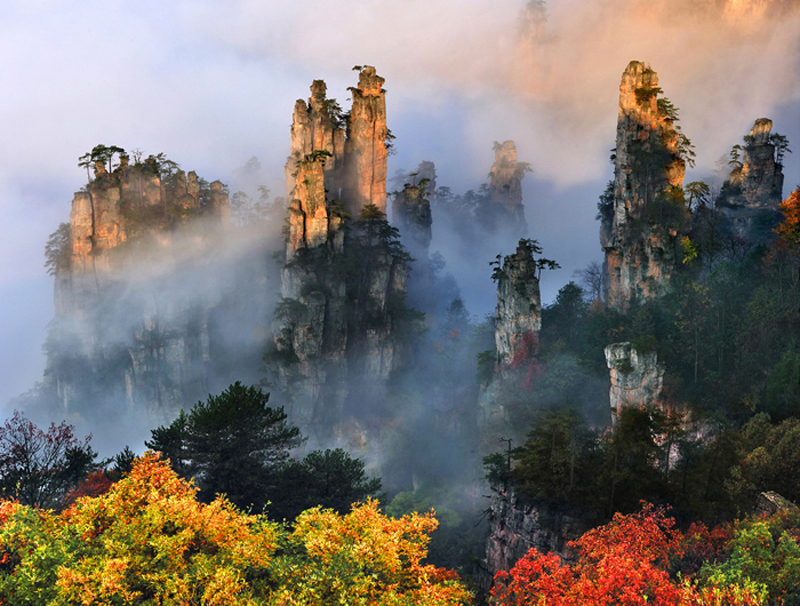 With a total area of 72,000 acres, Zhangjiajie National Forest Park is covered with rich plants which have 98 families, 517 species, over twice the total in Europe.Its gymnosperm species take up half of the total in the world. Zhangjiajie National Forest Park is famous for its unique peaks, tranquil water and beautiful green forests.Its main scenic spots include the Golden Whip Stream, the Yellow Stone Village(Huangshi Fort or Huangshizhai), Yaozi Fort( Yaozizhai) and so on. 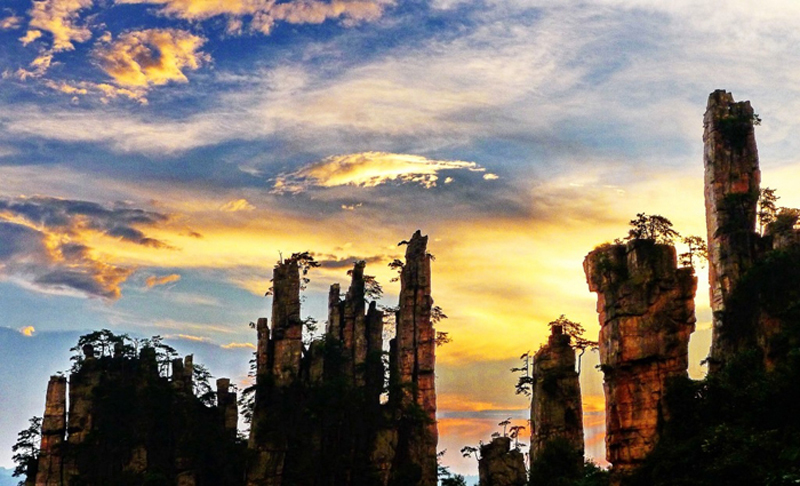 Here,numerous pinnacles rise abruptly from the level ground in the shape of huge bamboo shoots pointing to the sky. Named after the 380-meter high Golden Whip Rock, the Golden Whip Stream meanders 7.5 kilometers which flows in a beautiful canyon between steep grotesque peaks and luxuriant trees . There are meandering streams, crystal-clear waterfalls, exotic plants ,rare animals. No wonder it is called “the most beautiful valley in the world” and “the most poetic stream”. Yaozi Fort faces the Yellow Stone Village. 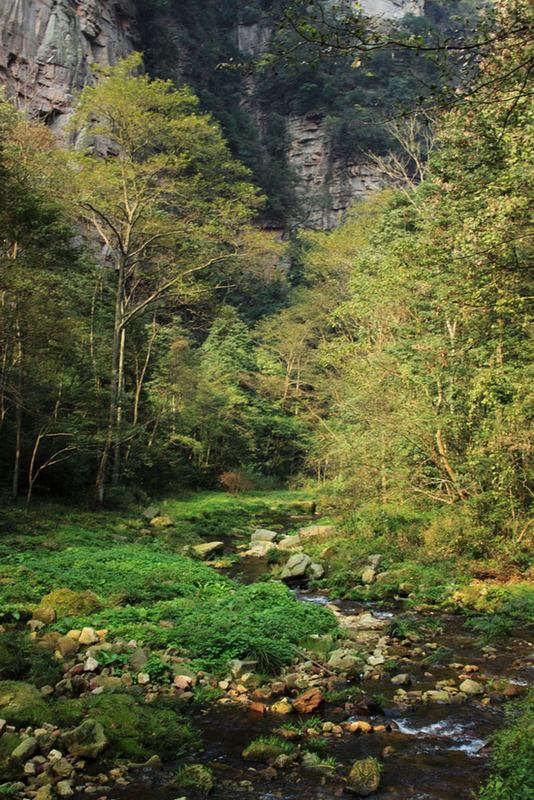 It’s one of the three important scenic spots in Zhangjiajie National Forest Park. The path has been rebuilt well in Yaozi Fort, although less tourists of group tour visit there, it’s a best place for trekking tour. Located in the north part of Zhangjiajie National Forest Park, Yuanjiajie is one of the classic tour routes in Zhangjiajie.Yuanjiajie is a natural platform that faces giant rocks rising from deep valleys and surrounded by higher mountains. Unique in their shapes and covered with pine trees, these rocks resemble a vivid Chinese painting. Yuanjiajie is one of the must sightseeing places for tourists to travel in Zhangjiajie. Situated in the south border of Yuanjiajie Scenic Spot, the natural stone bridge flies between the two great stone peaks.With it’s width of 2 meters, thickness of 4 meters, span of 50 meters and relative height of 400 meters, the stone bridge is not noly a miracle of nature in Zhangjiajie,but also under the sun. So,it is named No.1 Bridge In The World by tourists. Hidden in southeast part of Yuanjiajie Scenic Spot, Mihun Stage is one of the best platform to get sight of the sceneries. Standing here for overlooking, you can see many unique stone peaks stand in a deep canyon.Some stone peaks look like soldiers gethering. Staying here for breath taking, one’s soul would be fascinated by the carmful and beatiful scenery to throw into the deep canyon. Back Gaeden is located in the south part of Yuanjiajie Scenic Spot. Lots of strange stone peaks stand there like woods,and some green trees grows on the stone peaks. If it’s after raining and the stone peaks are surrounded by mists and clouds, a beautiful Chinese painting will be clearly got your sight. Standing there for sightseeing, what a beautiful bonsai garden it is! The peak is formerly named the South Sky Pillar which is 1,074 meters above the sea level and one of more than 3,000 mountains in the Yuanjiajie Scenic Spot. 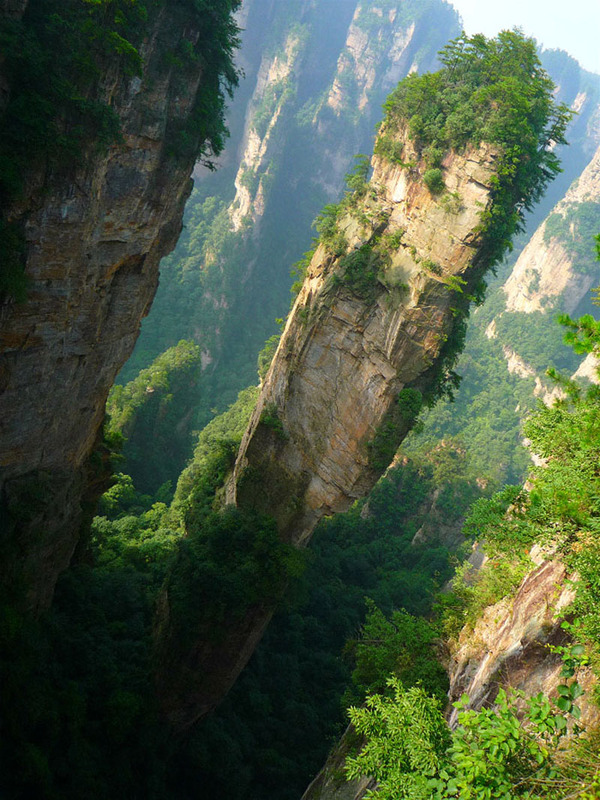 In 2008, Hollywood photographers spent four days shooting Zhangjiajie. His pictures became the prototypes for many elements in “Avatar”. The pictures inspired the movie director James Cameron to feature the floating “Mt. Hallelujah” in the world of “Pandora”. In 2009, the peak renamed Avatar Hallelujha Mountain. Tianzi means ‘the Son of Heaven’.The name of ‘Tianzi Mountain’ came from the story about Xiang Dakun, a famous leader of Tujia Ethnic in the early Ming Dynasty(1368-1644). It was said that Mr Xiang Dakun led the local people to fight against the government officials,he called himself ” Tianzi” ,and local people called him “King Xiang”. So,the mountain had been calling”Tianzi Mountain”since that time. Tianzi Mountain is one of the four scenic spots in Wulingyuan Scenic Area.It’s surrounded by Suoxi Vally on the east,Sangzhi County on the north,Zhangjiajie National Forest Park on the south.With an area of 67 square kilometers,Tianzi Mountain lies on the highest point of “Golden Triangle” . The landscape in Tianzi Mountain is natural and primeval. There is nothing artificial in the area. There is a saying that ” people who have visited Tianzi Mountain wouldn’t climb any other mountains.” and “It can not be said that you have been to Wulingyuan without reaching Tianzi Mountain”. Located in Tianzi Mountain, He Long Park was founded in 1986. He Long, born in Sangzhi County in 1896, was one of the ten Marshals of the People’s Republic of China. Tianzi Mountain was one of the places where He Long once led his army to fight in 1930s. The Statue of He Long stands in the park in order to let more people to konw and remember Marshal He Long. Situated in the west of Suoxiyu Valley, the West Sea is a basin-like landform with a collection of peaks and woods. In this “sea”, numerous peaks stand with different shapes and poses, covered with lush vegetation. Therefore, it is called “sea of trees” and “sea of peaks”. In spring or summer or a clear day immediately after a rain in autumn, the clouds are surging and rolling like waves, covering the whole sky and earth. The view is so magnificent that it is called “sea of clouds”. The combination of the three seas is the characteristic of West Sea. In it, Gate to Heaven and Sky Terrace are wonderful scenes. Standing side by side with different height, the three rock peaks look like China’s writing brushes. It was said that the three writing brushes were once used by King Xiang. So,the scenic site is named the Emperor’s Writing Brushes Peak( Yubifeng in Chinese). 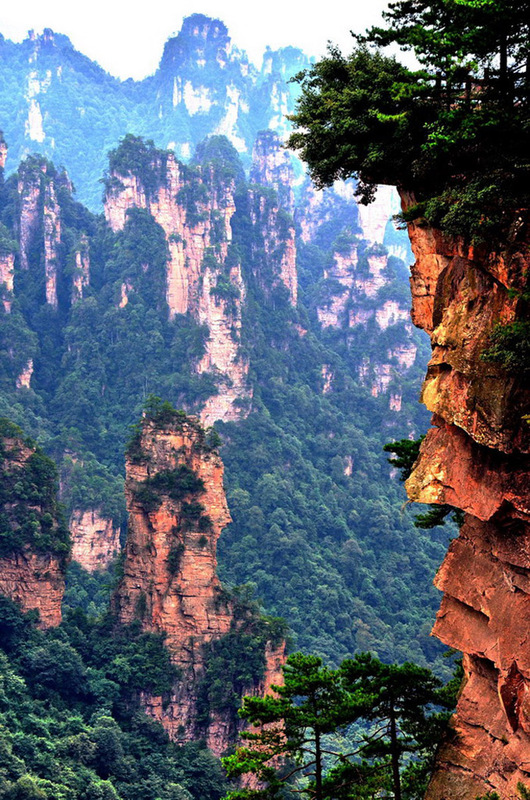 The Emperor’s Writing Brushes Peak is the symbol scenic site in Zhangjiajie. As the legend goes, King Xiang jumped down at the high cliff in Tianzi Mountain afer his army failed at the last battle in Baizhang Gorge (the entrance to drive from Zhangjiajie City to Wulingyuan). One of Tujia Lady was deep sorrow when she got the bad news. And she hurried up to Tianzi Mountain to look for the hero of Tujia Nationality. She took a basket of flowers and stood there to welcome her hero. Time went day by day,she couldn’t look for King Xiang. Because of being deep sorrow, she became stone statue at last.